We will employ "reasonably reliable System engineering" to design and develop satellites enthusiastically, and launch a total of five nano satellites in space over the next four years. Our plan is to use the first satellite for general missions, the second for scientific missions, and the third to fifth to let them function in a coordinated way to accomplish goals (constellation mission). The concept will realize the development of satellites with high design accuracy at low costs, thereby contributing to space exploration of the future. Based on an entirely new concept, we believe design moderately or reasonably improves accuracy. 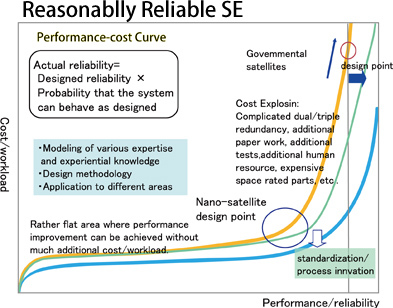 We will continue our challenges in securing reliability according to this new benchmark, and develop and launch Nano satellites actively. ＞＞ remote sensing satellite "HODOYOSHI-1"